Siam Bay is the northern most bay of Racha Yai. The bay consists of rocky edges and the center bay area is sand covered with a hard coral patches. There are a few man made monuments in the center of the bay depicting two elephants and a big temple gate guarded by a mythical giant sentry, known in Thai as Yak, who is believed to protect the gate from evil spirits. 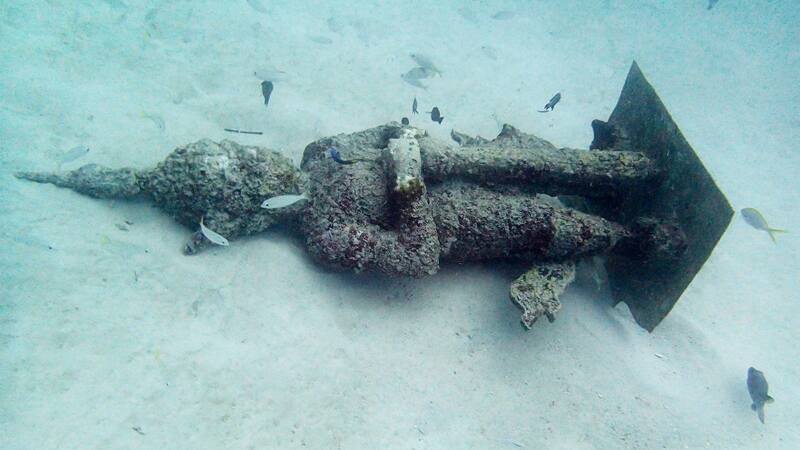 These statues are situated between 18 and 20 metres and should be the dropping point for the start of the dive. They are marked by a mooring line and should be relatively easy to locate. One of the best places to find Kuhl’s Stingrays which can be found hiding in the sand along the peacock flounder. Parrotfish, triggerfish, butterfly fish and barracuda are common to these waters. Turtles, Octopus and cuttlefish also make an appearance here. Dives here have also produced some good unusual and rare marine life including some large stonefish, flathead crocodile fish and some lovely colored nudibranchs so keep your eyes peeled whilst diving here. A nice easy dive site makes for a good beginners and training site and is popular all year round as it offers protection from both the easterly and westerly winds. and is ideal for your PADI Open Water Course. This site is also popular with snorkelers. Dive boats go to Racha Noi every day of the week as a part of a 3-dive combo with Racha Yai. There is also a two dive trip to “Racha Yai only” running everyday of the week.